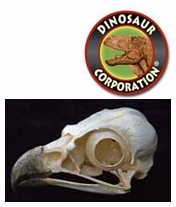 Raptor skulls are museum quality replicas. Cast in durable Polyurethane resins. Made in USA. Birds of prey are birds that hunt for food primarily on the wing, using their keen senses, especially vision. They are defined as birds that primarily hunt vertebrates, including other birds. Their talons and beaks tend to be relatively large, powerful and adapted for tearing and/or piercing flesh. In most cases, the females are considerably larger than the males.